Google trends is a free tool offered by Google that allows users to measure interest of a given search query. The tool shows the interest over a fixed amount of time in addition to interest by region of any given query. The Query results can be filtered by location, time duration, category, or type of google search. Google Trends ultimately helps marketers find answers to the looming question: What do users search on Google? This is certainly subject to volatility depending on chosen filters. Filters such as time duration, region, and category provide incredible insights into market trends and emerging products as well as help account for seasonality. 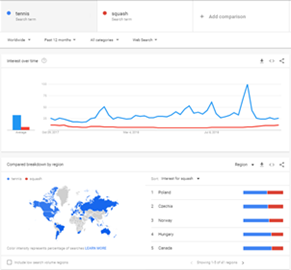 Traditionally, users enter a search query into Google Trends, and in turn Google Trends generates information pertaining to that term according to historical web search metrics. As you’ve likely noticed, Google search results have become multi-faceted and often include videos, news items and images alongside the web links we’re used to. It seems natural, then, for Google Trends to follow suit and allow for searches within each of these verticals – and that’s exactly what they’ve done. One notable tool available on Google Trends is the Compare function. Compare allows marketers to dig into semantic variations and moreover compare like items. This image shows comparatively the global density for search and interest in Squash as shown in red, and Tennis, shown in blue. Tennis and Squash are sports of similar nature. Both are racket sports that have two players, and a ball. The volume and interest over time is drastically different. Below is an image that shows the interest by region along with the different queries for each respective term. For tennis, the first related rising query is in fact a video game rather than a tournament or anything related to the sport. The squash category only has one search about the sport itself. The rest refer to the vegetable. These semantic differences are what markets need to learn to weed out to attract users with true intent. 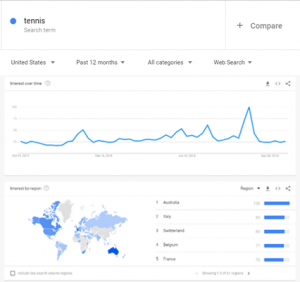 Through using Google Trends, we now determined that Tennis has a higher global search volume than squash. We also found out that much of the search volume involving squash has to do with another category with semantic similarities, the squash vegetable. Both categories demonstrated a strong need for long tail keywords. Typically, long tail keywords are 3-4 terms in additional to a major keyword like tennis that help clarify relevancy. For example, “US open tennis 2018 results” is a much more specific query than something vague like “US tennis”. The ultimate aim for integrating long tail keywords is to drive high converting and engaging traffic, rather than traffic for the sake of traffic. Just because a term has high search volume doesn’t necessarily mean you should chase after it. As we saw with the Squash query especially, one MUST use long tail keywords, otherwise you will have users looking for recipes rather than match results. What does Google Trends mean for SEO? As far as SEO and market research is concerned, Google Trends shine light toward semantic differences in keywords that can illustrate a searches intent. It’s not enough to compile a list of keywords exactly relevant to your company anymore. To be successful one needs to incorporate the full spectrum of what your customer persona is interested in, drawn to, and looking for online. These interests of course, change overtime. There is an immense amount of free data available. We recommend that you use it to your benefit. Start to untap what’s trending around you and your clients and integrate Google Trends into research and reports. To see what’s trending in the Chicagoland area by following the Logical Media Group Chicago trends Scoreboard.